I am asked many times why I take a lot of extra time to cut figures away from sprues or "broccoli bases" like those you see on Reaper figures. 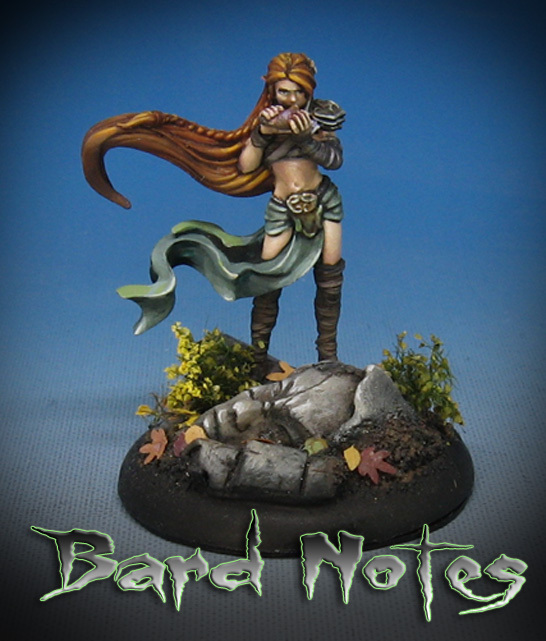 This wonderful bard from Circle of Blood is a reminder of the rewards of that little bit of extra work. Ridding the figure of the sprue or broccoli base opens up all kinds of wonderful opportunities for basing, such as this sculpey base that I made. With very little effort, it provides a better story than your typical rock and grass base. Also, since the figure has a pin in the foot, you can paint it attached to a dowel rod or even a pin vise. This makes it easier to hold onto, reach those hard to get to areas, and also prevent any paint from getting onto your base and vise versa. I am in the process of creating more basing videos, especially in regards to units. I am trying out the new Chaos Runes texture roller from Green Stuff World to create bases for the Dark Elf figures. I have already posted some preview videos of what is to come for the folks who are pledging $5 or more on the Patreon Page. The new pledge levels have been worked on as well, as I want to have options at $10, 15, 20 and so on. Some of these involve discussing your armies with you, figuring out a basing scheme and so on.